Providence Park also known by its original name of Multnomah Stadium after the field it was constructed on is an multi-purpose outdoor sports venue located in Goose Hollow district of Portland, Oregon. 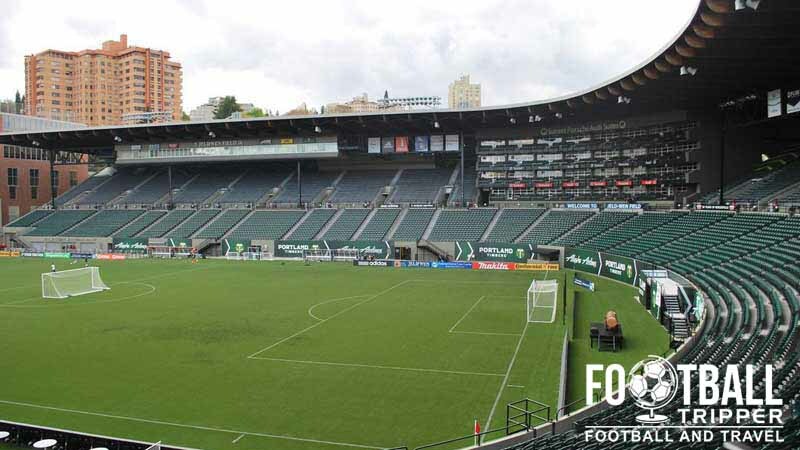 Home of Major League Soccer side, the Portland Timbers since 2001, Providence Park underwent renovations in 2009 to bring it in line with new MLS standards. The site on which today’s Providence Park Stadium sits has been used for various sporting activities since the late 19th century. Originally known as Multnomah Field upon opening in 1893, after the resident Athletic Club, the ground was purchased by the city of Portland in 1966 and became the Civic Stadium. The Portland Beavers baseball team were the resident club until 2013 when Portland Timbers became the sole tenants. 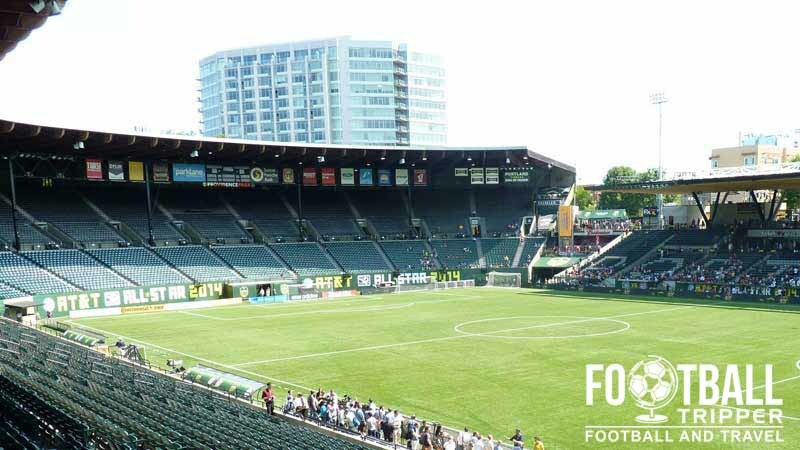 Naturally, Providence Park has undergone several renovations throughout its history, and in July 2009 arguably the most notable ones occurred when the stadium was entirely redeveloped as a soccer stadium. After the governing body of MLS approved Portland’s bid for a franchise, the newly formed team would need a stadium and a reconfiguration of the baseball field was deemed the most economically viable option. Costing around $36 million in total, the council soon identified a new home for the Beavers at Vaughn Street Park, and began rebuilding stands around the premise of a rectangular pitch. The newly renovated stadium held its first competitive fixture against Chicago Fire on 14th April 2011, with the Timbers delivering an entertaining 4-2 victory in-front of a 18,627 sell-out crowd. By the end of the season demand for tickets had already outstripped the number of seats available and the club added an additional section of seating which boosted the capacity by a few thousand. With the current capacity of 21,144 continuing to sell out don’t be surprised if The Timber’s ground is expanded in the foreseeable future. 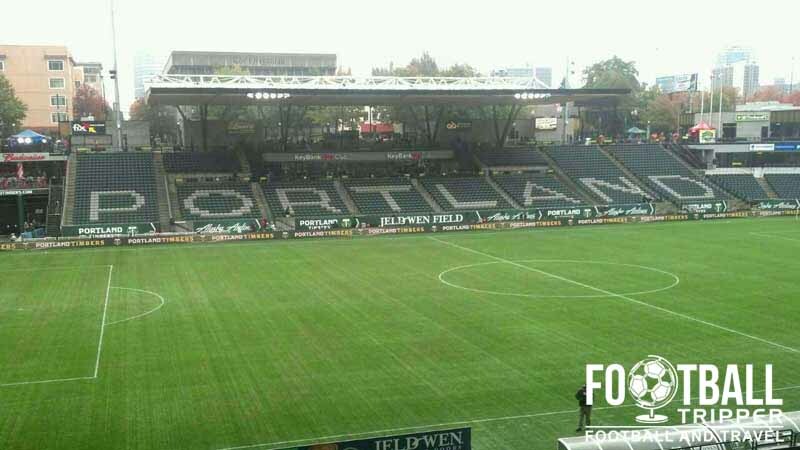 Over the year’s Portland Timber’s stadium has undergone a variety of name changes, with the ground known as the Jeld-Wen Field when the club first joined the league in 2011. In 2014 it was announced that the name would be changed to Providence Park after the Health & Services provider acquired the naming rights on a reported 15 year deal. Providence Park is comprised of four stands: North, East, South and West. The area of Portland is famous for its microbrew culture and at the stadium you can sample a range of beers from local breweries and Budweiser to imported European lagers and soft-drinks. Food inside and around Providence Park is served by Centreplate Inc which caters for a diverse range of tastes including American classics such as hot dogs to speciality foods such as Vegan Thai Curry. Produce is also sourced locally where possible. Portland’s main club shop (The Timbers Team Store) is located at KeyBank Plaza which is accessible via gate 2. There is also a smaller satellite store which is located within section 109 as well as numerous standalone kiosks and the official online store which is run by the Major League Soccer. Inside the Portland Timbers Shop. Lot’s of green is often exchanged on matchdays. Fans of the Portland Timbers can be privately booked by contacting the sales team via phone (503.553.5429) or by sending an email to [email protected] Tours of Providence Park can either be scheduled during the week or weekends and usually last anywhere between 45 minutes and an hour. Please note that bookings can only be made up to a week in advanced, and each tour group is limited to a maximum of 30 people. 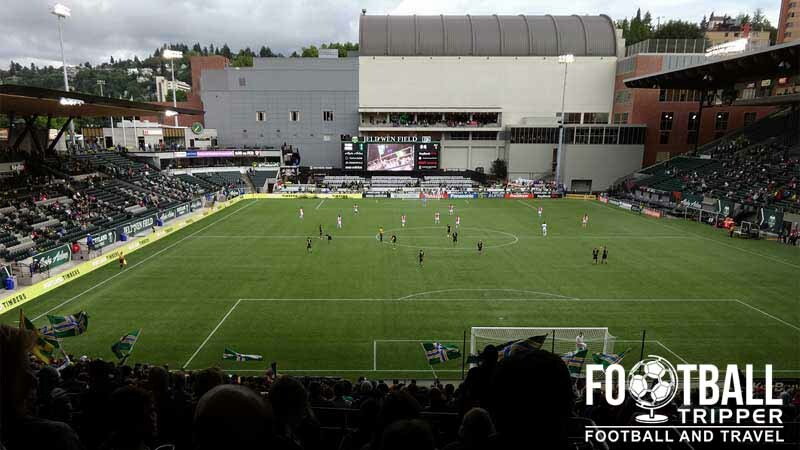 Single tickets to see Portland Timbers play at home range between $18.00 – $142.00 depending on where you sit, although the prices do not include booking fees and tax as standard. Providence Park is located in downtown Portland within a densely populated Urban area, and thus the Timbers encourages fans to make use of public transport if possible. The main entrance of The Timbers’ stadium complete with Providence Park sign. Trimet run additional train services on matchdays before and after the game in order to accommodate the larger number of passengers than normal. For complete information regarding both the Max Light Rail and Express Bus Services please visit TriMet.org. From SW Morrison and 5th, or Morrison and 10th you can catch an express bus to Providence Park on matchdays. The bus services are also operated by TriMet and run for approximately 90 minutes either side of the match similar to the trains. Parking is extremely limited around the ground, and unlike other soccer stadiums across the United States which are out of town, there simple isn’t room to construct large parking lots. Portland Timbers fans proudly flying their colours before kick-off. 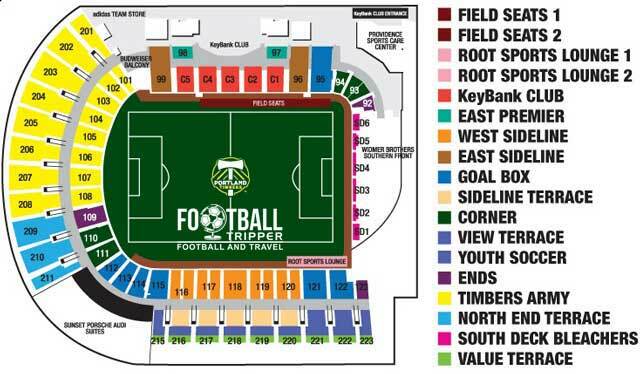 Portland Timbers recommend either parking at the Volvo Lot on SW 21st avenue or the Mazatalan Lot on 21st and Morrison. Fans can also park at Fox Tower with patrons receiving a $1 discount off parking if they show a Timbers ticket upon arrival. Cycling is immensely popular in Portland and a lot of the bike rack spaces are sold out on a yearly basis by season ticket holders. There is however a limited number available to the general public, although it’s recommended that you get to SW Morrison Street/SW 18th Avenue Intersection early to avoid disappointment. The closest hotels to Providence park are either the Hotel deLuxe to the east or the much more affordable Park Lane Suites & Inn to the west. Situated in the heart of down-town, there is a plenty of choice when it comes to accommodation a 1 mile radius of the stadium.